and preach the gospel to every creature." The Bible tells us to go into all the world and preach the gospel. This is an important call God places on the life of every Christian. To some, that call takes them away. Away from their country, away from their home, away from the comforts they are used to, and away from friends and family. Yet to some, that mission call takes them right to their living room. Fellow mom, whether your child is 2 months or 20 years, whether you have 1 child or 10 children, whether you have a job outside the home or you are soley a mom, you are a missionary. You have a call on your life that God Himself placed in you. This call is to reach your children for Him and your mission field is your home. It's a big call friend. 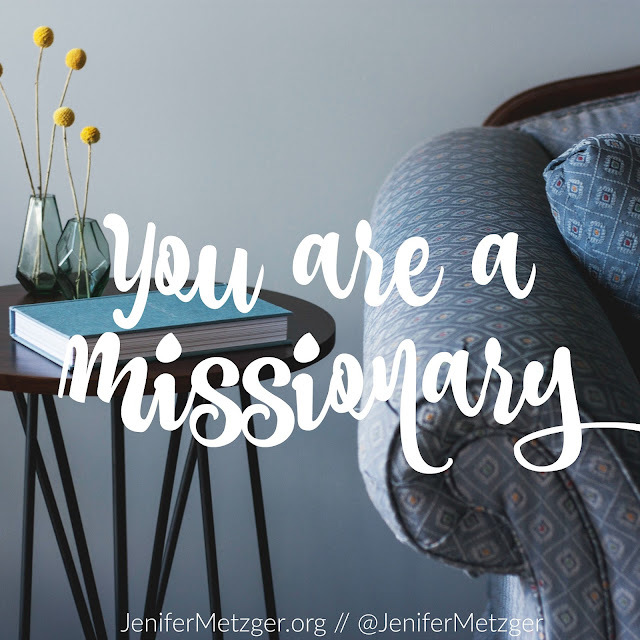 but know this: God gave you this call because He knew that you were the exact missionary your children needed. You can do this, you can lead your children to the Father. Lead them by being the best example of Jesus you can be. Let them see how incredible it is to live for God. Live your life so that your children want to live for Him. Embrace the call. Be a missionary to your children.